Fitting progressive lenses on a person with presbyopia is a complex technical act that requires know-how, experience and psychology. The success of a fitting depends on a chain of actions that can each be a source of inaccuracy. In a large study conducted in France with Les Opticiens J. Torrilhon, we have evaluated the satisfaction levels of people wearing Varilux® progressive equipment. This article presents the various results that we have obtained and offers an analysis of them. Through this study, our primary objective was to evaluate the satisfaction rate of people wearing progressive lenses from the Varilux® line for the first time. Secondly, we wanted to understand the various causes and scenarios that might cause wearers to feel dissatisfied or to return to the store after noticing a problem with their equipment. In general, the expression of such dissatisfaction is, in fact, the result of their inability to adjust to the lenses. This notion remains very generic and does not help to explain the real causes of the wearer’s problems. The analysis of the results shows us a more complex reality that can include all the actors involved in the chain to develop a progressive apparatus. In order to precisely understand all the factors that can have an influence on the return process especially, we conducted this study by making sure that we acquired a large anount of information about the wearer and his/her equipment. "The notion of 'non-adaptation' to progressive lenses remains very generic and does not help explain the real causes of the wearers problems"
In order to meet the objectives of this study, we developed a new test methodology that draws on the expertise of opticians. In fact, to meet all of our requirements, we have combined the two usual test models: a standard wearer’s test and a market test. The goal was to obtain a well-controlled protocol, applied in the real conditions of the fitting and delivery of progressive equipment on a very large number of wearers and providing a significant amount of data from wearers and opticians. We conducted the study in optical stores. A total of seven stores from the Les opticiens J. Torrilhon group participated in the study, and 73 opticians contributed to the collection of data. Wearers were recruited on a voluntary basis, and only future Varilux® lens wearers were eligible (excluding Varilux® Sun). Our goal was to reach 1,000 wearers who would agree to participate in the study. Our main constraint was to collect as much information as possible about wearers and to match them, each coming from different sources. We developed three surveys to gather information during the different stages of the study. 1- General survey: given on the first meeting with the optician. This aims to learn the history of the wearer and assess his/her current level of satisfaction. The protocol requires each volunteer to sign a document informing them of the purpose of the study and how the data will be used. 2- Satisfaction survey: sent to the wearer by email approximately three weeks after the equipment has been delivered. This aims to evaluate the level of satisfaction with the equipment received, the wearing conditions, the wearing frequency and situations that may have posed a particular problem. 3- Professional survey: for the optician. This survey allows the optician to express, after a return, the result of his/her analysis of the case and to tell us the actions he/she has taken to correct the problem(s). In order to complete these different surveys, we have determined, for each of the participants, the characteristics of their equipment: product, prescription, fitting parameters, personalization parameters, and so on. 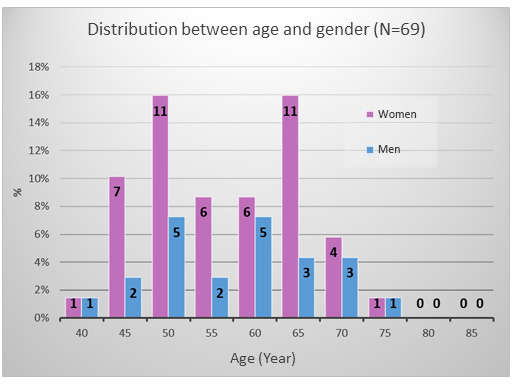 Figure 1: Gender and age distribution of those who responded to the satisfaction survey. The protocol does not affect current prescribing practices. The optician remains free to proceed as usual. It’s worth noting that, in the vast majority of cases, the 73 opticians use the electronic column to perform fitting measurements. Sampling was spread over five months; a pilot period made it possible to test the complete protocol under real conditions. Unlike a large number of other studies, the sample of this one is not recruited according to particular characteristics (except lenses worn). It goes without saying that this population is not equally distributed in gender, age, prescription, and so on, because, according to the protocol adopted, it is representative of a sampling without constraint. The sample recruited in stores represents 1,006 wearers. Due to lack of data or data reconciliation inconsistencies, we only retained 810 wearers. 501 wearers responded to the satisfaction survey. We will consider this figure as a basis for calculation. As previously stated, we did not try to balance the sample according to various characteristics. It is therefore representative of the people who frequented the stores associated with the study. However, we noticed that the distribution is still relatively consistent with what can be expected from a presbyopic population, with an average age of 50 to 55 years old and a prescribed addition centered on 2.50 dpt. Of note, there was a significant number of wearers with an addition greater than 2.50 dpt (124 wearers), or 25% of the sample. Gender and ametropia characteristics remain balanced. Over 60% of progressive lenses worn during the study were from the Varilux® S Series line. 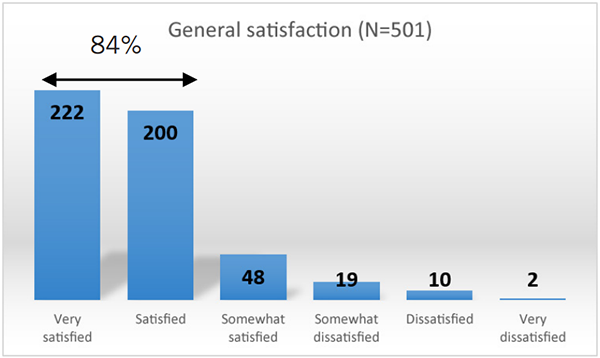 The assessment of satisfaction was based on the analysis of the satisfaction survey sent to wearers by email. The assessment of overall satisfaction is directly addressed by proposing a six-point rating scale (from very satisfied to very dissatisfied). Of the 501 wearers who responded to this survey, 422 expressed their total satisfaction (very satisfied and satisfied) with the equipment provided by the store, which represents 84% of respondents. If we include wearers who were fairly satisfied, this satisfaction rate reaches 94%. We should point out that we noticed that a significant number of wearers who expressed dissatisfaction did not return to the store. Of the 79 dissatisfied wearers, only 15 returned to the store. 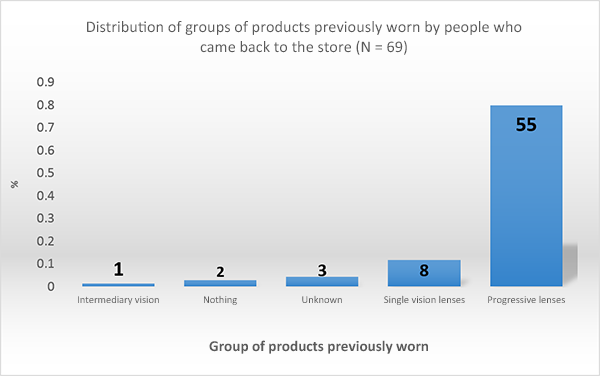 In addition, Table 1 shows a very low rate of returns to the store for new progressive lens wearers who expressed their dissatisfaction, only 4.2%. Table 1: Distribution of satisfaction for new and previous progressive wearers and rate of returns in-store. Figure 5 shows the satisfaction rate as a function of the addition prescribed. We do not observe a significant variation in satisfaction with the addition between previous progressive wearers and new wearers. 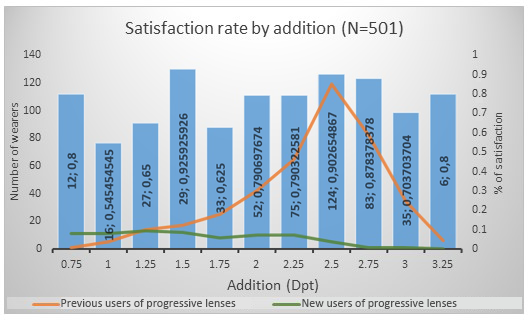 Please note, however, the significant proportion of new progressive lens wearers who have a high addition. Figure 5: Satisfaction rate as a function of the addition prescribed. Apart from the dissatisfaction expressed in the survey, the protocol made it possible to take into account and analyze the cases of wearers returning to the store. Some 69 wearers returned to the store, which is 8.5% of the total sample (810 cases). This sample includes cases requiring major interventions regarding their equipment in order to restore comfort and/or visual performance. There is not necessarily a correlation between wearers who came back to the store and those who expressed dissatisfaction through the survey. 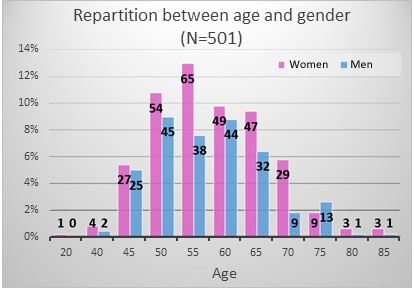 Figure 6: Gender and age distribution of those who came back to the store (all reasons combined). 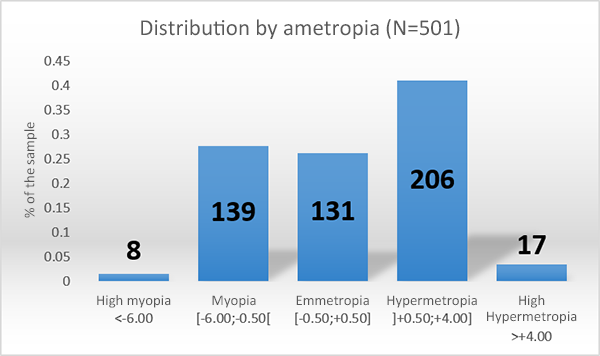 The distribution of ametropia is very close to the general distribution with a stronger representation of emmetropic people. However, this is not statistically significant (X² test = 1.03 to 5%). 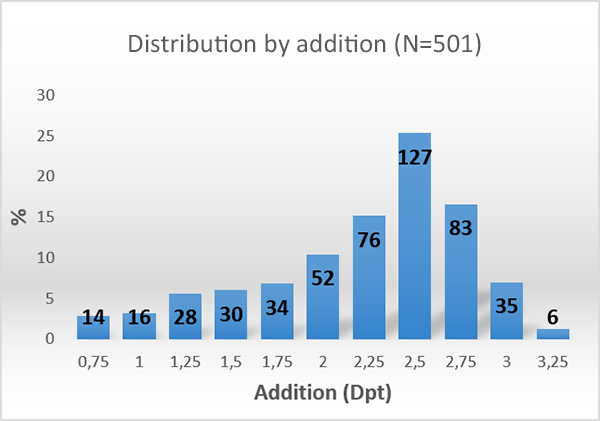 The addition distribution also follows the general distribution. This distribution makes up most of the sales (2.25-2.50 dpt). The [0.75-1.75] grade has a higher representation without being significant (X² test = 0.40 to 5%). 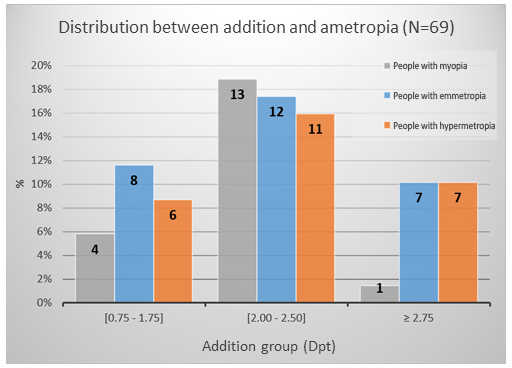 Figure 7: Ametropia and addition distribution of those who came back to the store. Figure 8 shows the distribution of the types of equipment previously worn and encountered in the study. A very large majority of returns (80%) came from wearers who were already equipped with progressive lenses. First-time buyers represent 20% of returns (equal percentage in the general sample N=810). The X² test does not show a link between returns and first-time buyers (X² test = 0.02 to 5%). 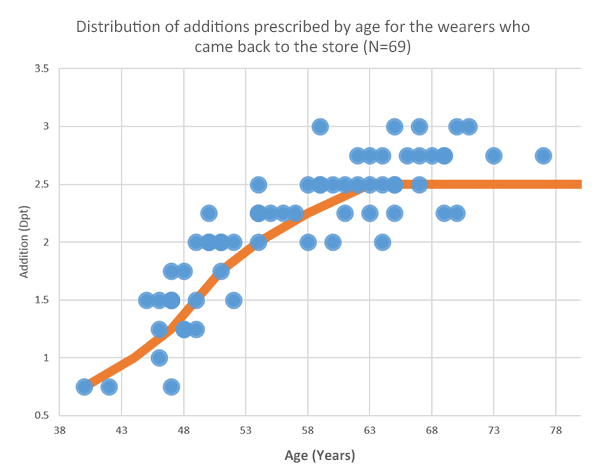 Figure 9 shows the distribution of the prescribed additions according to the age of the wearers returning to the store. Note that a significant number of wearers had an addition greater than 2.50 dpt. The X² test between the “over-addition” (> 2.50 dpt) and dissatisfaction variables shows a strong dependency (X² test = 10.06 to 1%). Figure 8: Distribution of the type of equipment presviously worn by wearers who came back to the store. Figure 9: Distribution of additions by age for the 69 wearers who came back to the store. More than a third of the cases of dissatisfaction were from correction problems in distance vision and/or addition. Another third involves the positioning of the lens in front of the eye. This includes measurement problems (pupillary distance, fitting heights), production issues (centering and edging), and problems with fitting the frame. The last third is related to service on lenses and frames. These cases include breakage, scratches, weight problems, aesthetics and treatments. It should be noted that there has never been a direct mention of dissatisfaction stemming from a problem of progressive lenses’ optical design. In order to solve the cases of returns, the majority of opticians, after their analysis of the situation and the identification of the problem(s), recommended new lenses (49 cases, new Rx, new fitting) or made an adjustment revision (15 cases, frames, pads). The volume of analyses that we conducted on the data in this study is much more significant than what can be relayed through this article. Nevertheless, in light of these analyses, we can formulate a number of findings that, until now, were general in nature and not supported by objective results. The proportion of Varilux® progressive lens wearers who are very satisfied and satisfied is 84% (94% if we include fairly satisfied wearers). When there is dissatisfaction, it is not confined to a particular category of the sample studied (by ametropia, addition, or type of lenses worn). Of note, however, is a significant number of new progressive lens wearers who are already older. These additions raise problems of adaptation right away. Overall, there is no link between the nature of the product and the dissatisfaction of the wearer. Problems of error correction, measurement, centering, and so on were the source of the majority of cases of dissatisfaction. With regard to store returns and for the standard cases of progressive lens prescriptions, the only very significant characteristic is an inappropriately prescribed addition. An important point worth noting is that a very large majority of unsatisfied wearers do not return to the store (81%), while 100% of returns dealt with in-store have resulted in a satisfactory solution for the wearer. Essilor would like to thank the Opticiens J. Torrilhon for making this study possible by providing us with access to the infrastructure of its stores. Aware of the efforts and difficulties that may have resulted from the implementation of the protocol in the stores, the authors warmly thank all opticians who have actively worked to ensure that this study would succeed. • The success of a progressive-lens fitting depends on a chain of actions that can each be a source of inaccuracy. • The notion of ‘non-adaptation’ to progressive lenses remains very generic, and does not help explain the real causes of the wearer’s problems. • A new study methodology, calling upon the expertise of opticians under real sales conditions in stores, allowed us to analyze more precisely the satisfaction rates of wearers equipped with progressive lenses and to better understand cases of dissatisfaction. • The proportion of progressive lens wearers who are very satisfied and satisfied in this study is 84%, and becomes 94% when including those who are fairly satisfied. 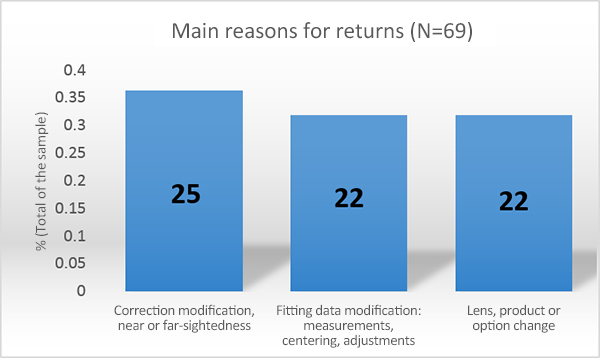 • The results show an almost equal distribution between the main causes of return: far-sightedness or near-sightedness correction problems (1/3), fitting data problems (1/3), and usage problems (1/3). • It should be noted that 81% of wearers who were not fully satisfied during this study did not return to the store, while 100% of the cases treated by opticians found a satisfactory solution for the wearer.